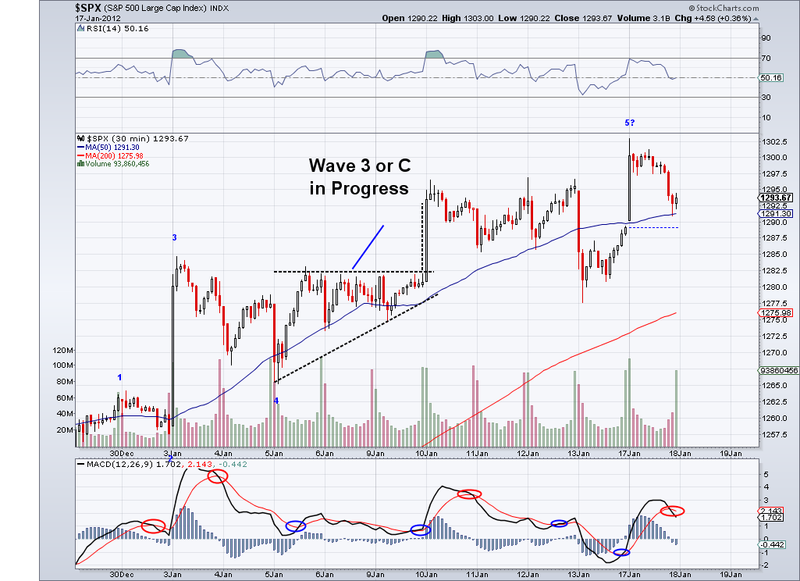 The market seemed to have put in a C leg this morning and it seems like we might get a complex correction. 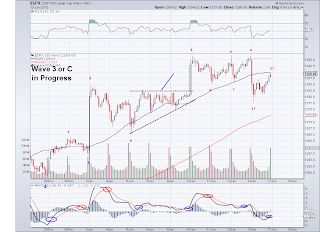 If the market can trade above 1320 then we might see the resumption of the bullish trend. Today we had the first close under the Trend Average in over a month and another bearish close tomorrow would confirm a bearish short term trend. Also, the MACD on the daily is giving a sell signal so while the golden cross is going to happen, the best time to get in the market might be after the market does a proper correction. 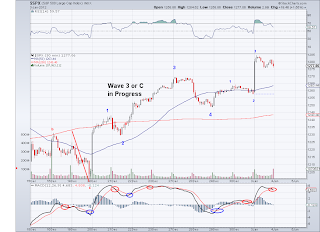 I am maintaining my short position in the meantime to see how the next bearish wave behaves. The market looks like it completed the A leg of this correction and we should see a retracement early next week for the B leg. 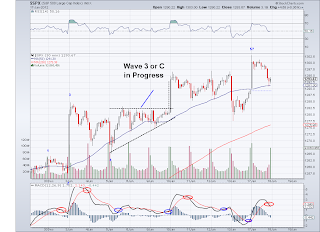 And as I expected the market tested the TA successfully today and bounced right off, however if the B wave does not bounce hard then the C wave should breach the TA and possible change the bullish short term that has been in place since December 21st. So I covered half my shorts and sold half my VIX positions at the TA and raised stops to break even, however due to how volatile this ETF is I got stopped out at break even on the other half. 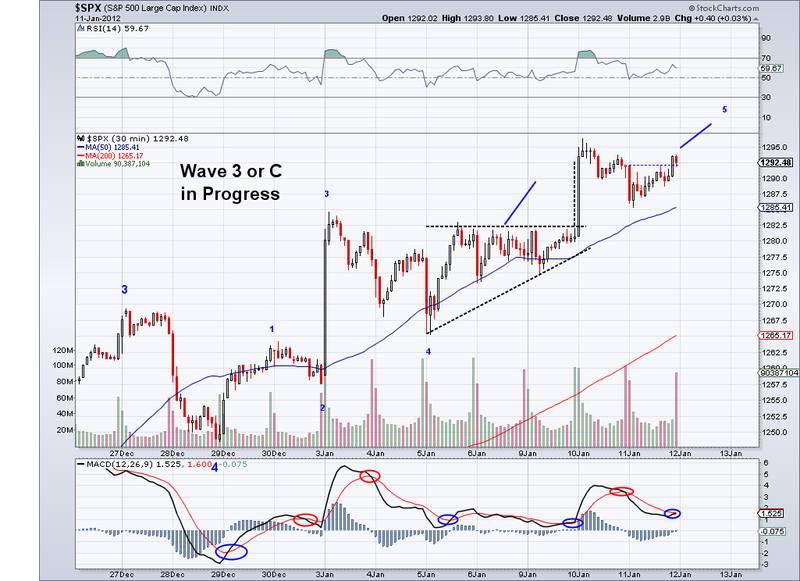 But should the B wave come as expected, I'll just buy it back at a lower price so no harm done. Today is the first time we have 2 consecutive (on the SP500 that is) down days since the Santa Rally started so the market does need a breather. Also, we should have the Golden Cross next week so we will be officially in a bull market but these same moving averages are very likely to be tested when the entire wave structure is done. So the place to get in this rally is at the test of the 50 or the 200 day MA. The market finally made it to the 1330's area as I had been expecting for the past couple of weeks and now we are starting the W4 correction. Which form will this correction take is too early to tell but I expect it to at least test the Trend Average (it got close today). If we go by proper Fib retracements, we should see 1283 but it's hard to get an idea this early. The best is to look at the TA for guidance. I am going to start by assuming an ABC move so today's leg will have a retracement and then the C leg will kick in which I am assuming it will go under the TA. If it does that without reversing then chances are it is going to the 1283 area. 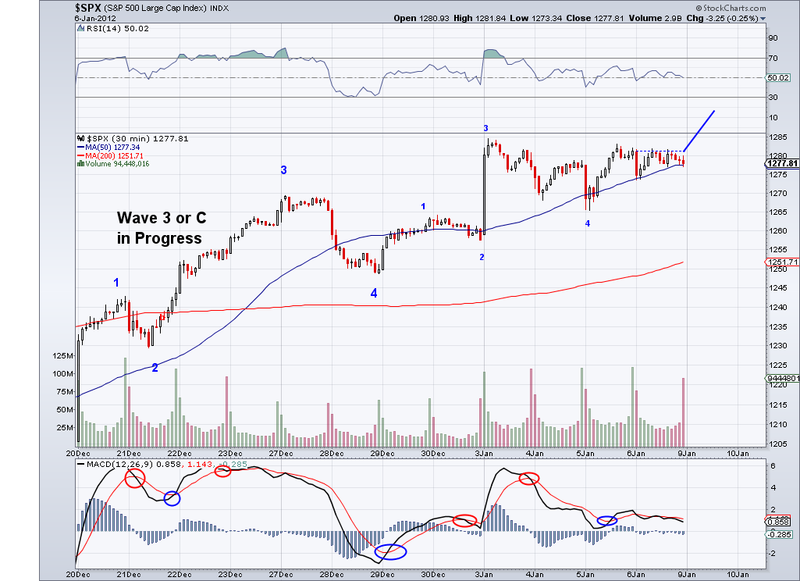 However, if the TA holds then it will be enough of a correction for the market to go on to the 5th leg to 1378 more or less. And per my post yesterday, I executed my plan as the market gapped up in the morning. 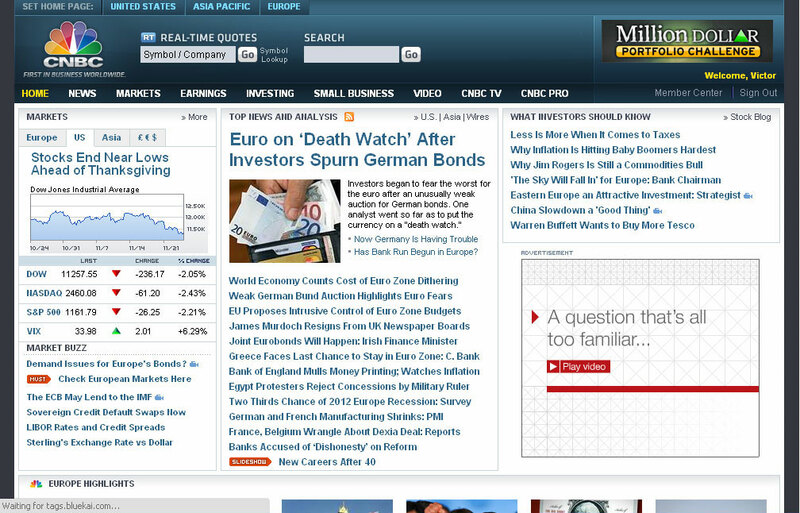 So I am now short and holding some VIX ETF. I am setting my stops to break even on my positions. 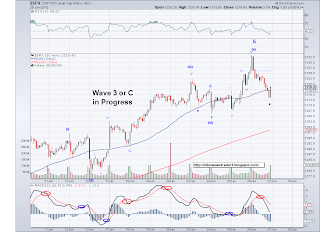 The market seems to have completed an ABC corrective pattern for a Wave 4 and unless this turns into a complex correction, we should see the market's last rally from here on. 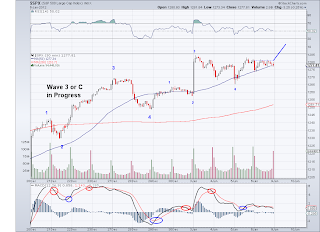 And the more time goes on, the more I lean towards labeling the current wave as a 3 primarily because of all trends are turning bullish. 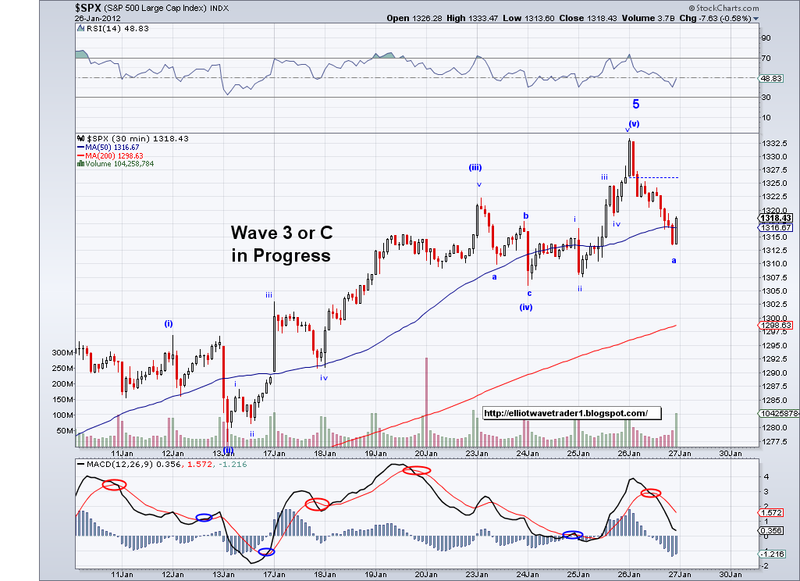 So I think once we get to the top of this Wave we should correct for a while before the market puts in a wave to the 1378 area. 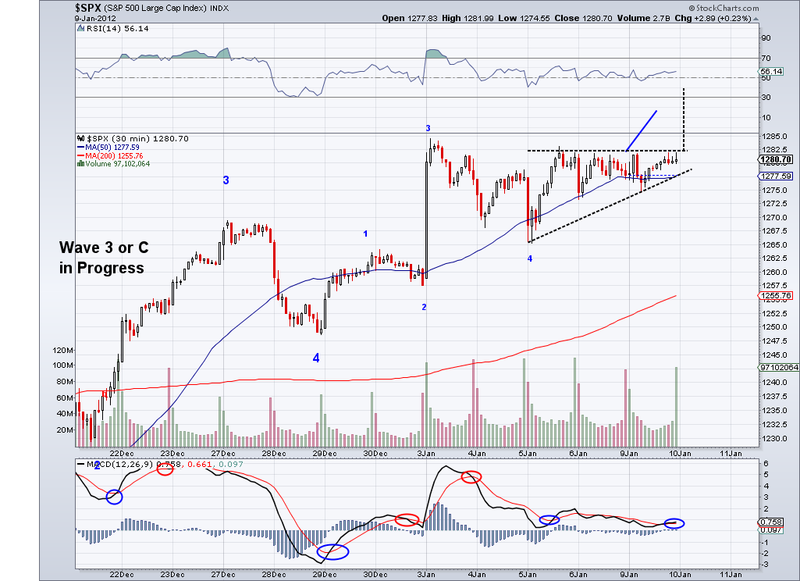 And if this is the case, then the coming correction is going to be a sideways (a triangle perhaps?) 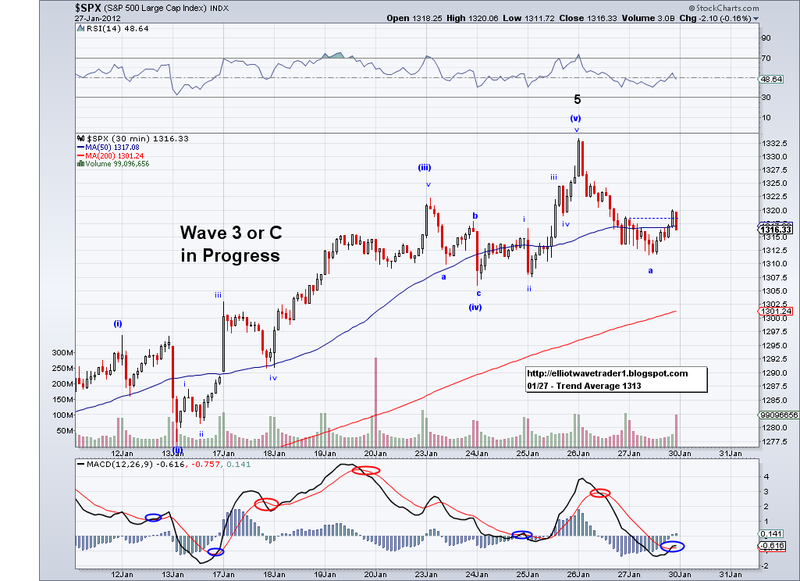 or an ABC (or complex) to the 1270 area more or less. 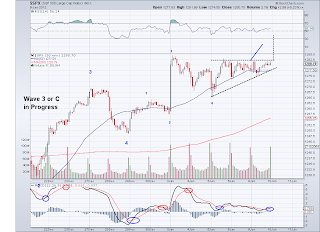 So the game plan remains to the same.. cash until a good risk/reward opportunity appears. The market appeared like it was going to rally early morning but it reversed fast. 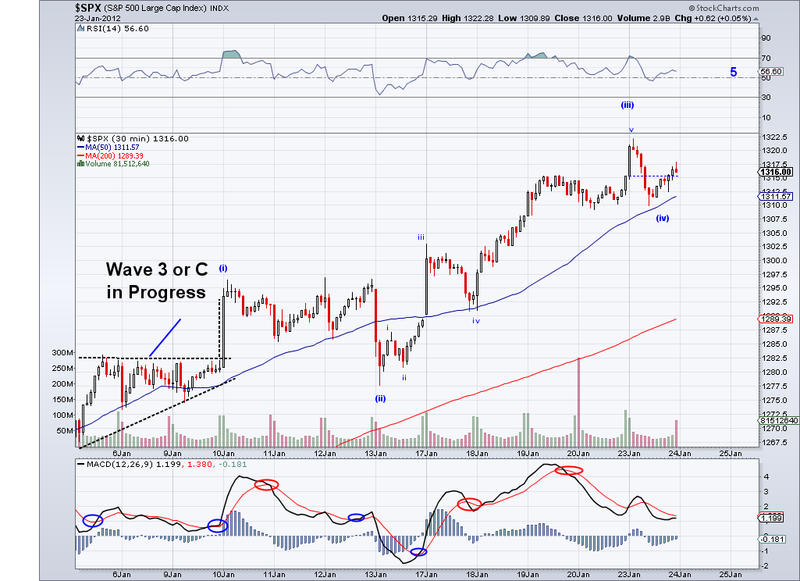 However, the pattern it left still allows for a final impulse wave to 1330's. 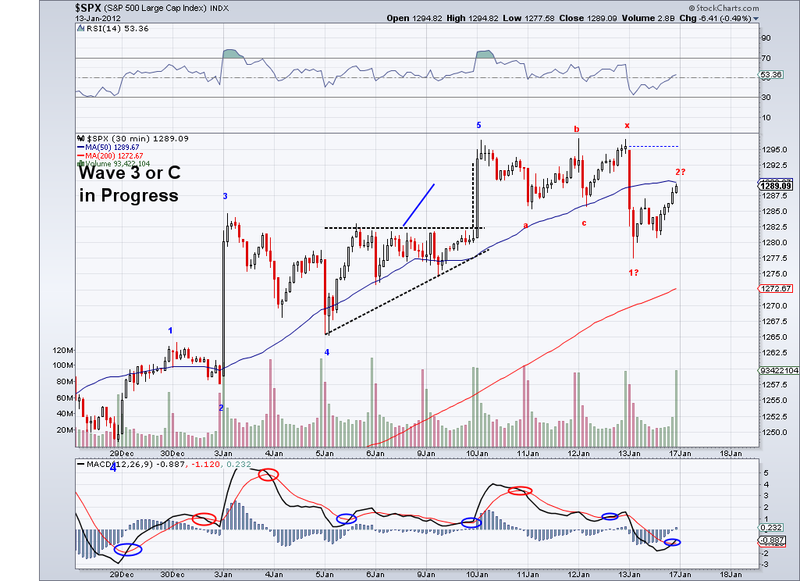 Technically, the market got somewhat close at 1322 but not close enough. 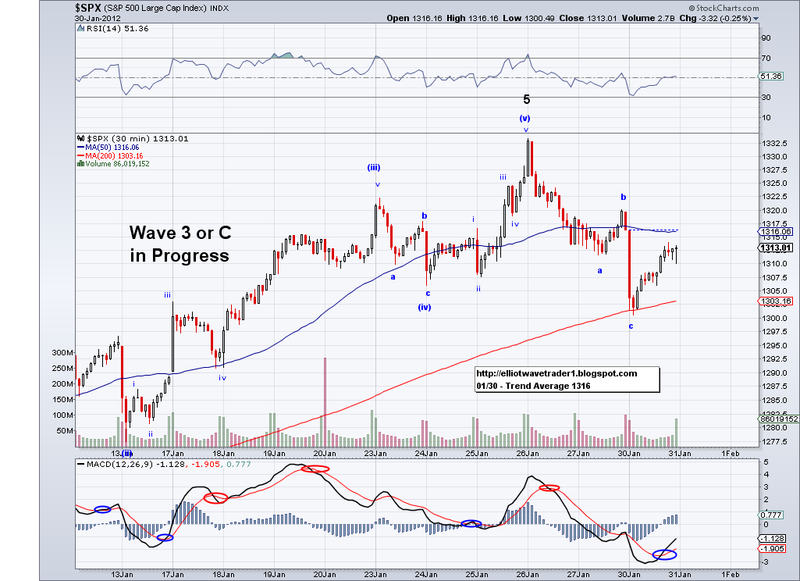 So I favor more upside, hopefully in a strong gap up/impulse wave that will open an opportunity to play the downside. 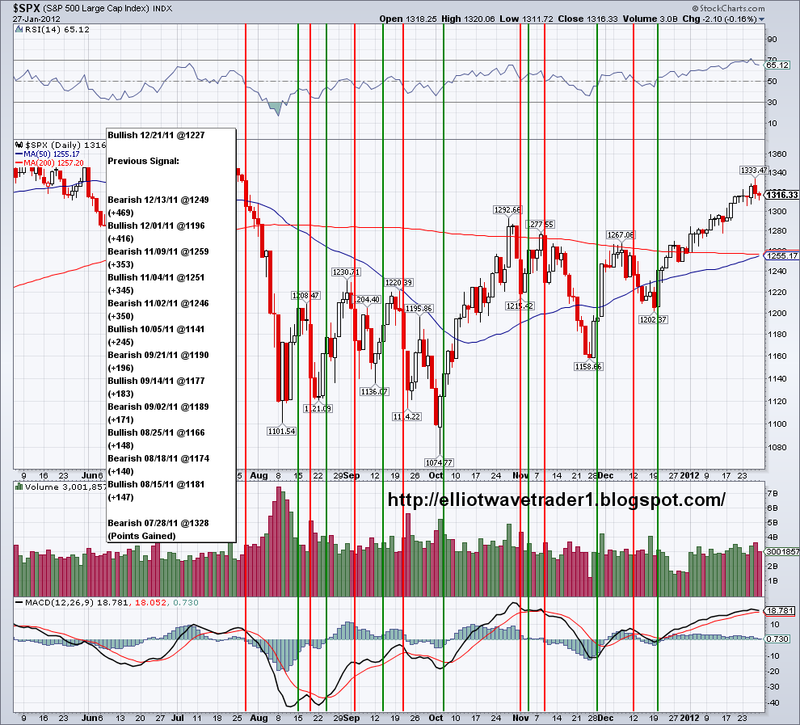 The market is already overbought but the ideal would be more overbought before going against the trend. 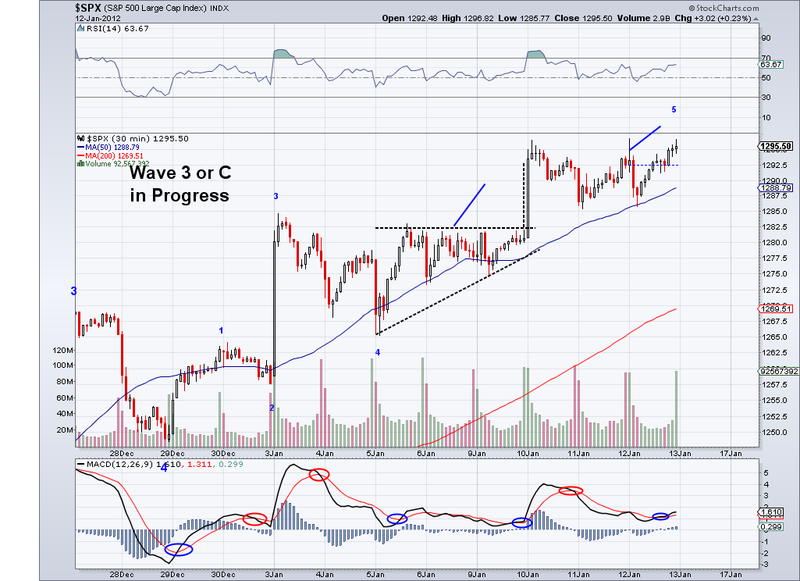 The Trend Average is at 1301 so I'm technically looking for high 1330's to short if the impulse wave comes tomorrow. Last rally early next week? The market technically corrected today in a sideways W4 in the minute count and set itself up for a likely rally starting early next week. 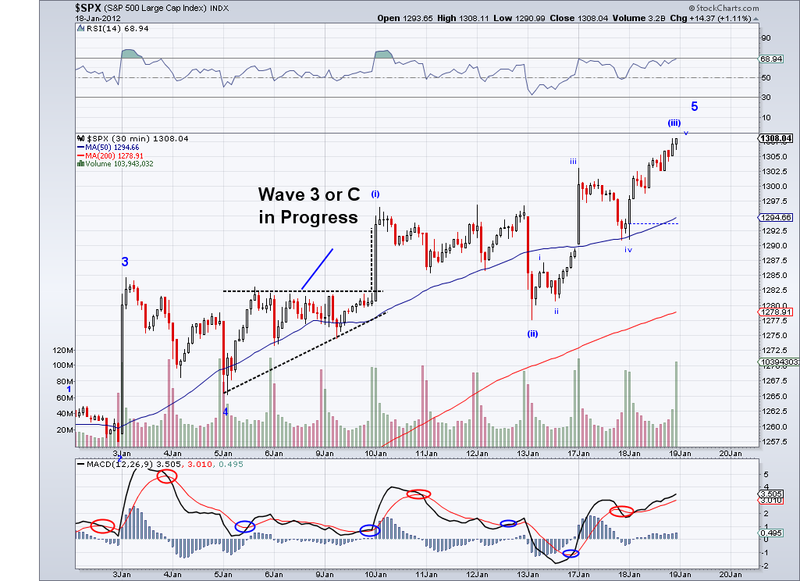 I assume this will be the very last rally for this last leg so we'll see if the market makes it to 1330. The TA is at 1298 and I assume it will reach 1300 early next week and per my "formula" for shorting uptrends, I am looking at a 36 point gap between the TA and the market to start short positions. I am assuming the coming correction will successfully test the 50/200 day MA (which should cross in the next week or so) so the plan will be to reload on longs at that point. All major averages are pointing to a bullish market(I'll post the main averages I'm following next week) and unless there is a bear miracle, we should see the market go for 1400. The market looks like it completed the V of W3 so again, just waiting for a minor correction and then one last rally to 1330's. The market is starting to get overbought but it is still not safe to short, so the plan is the same. Short at 40 points above the TA or stay in cash. All the recent good news will all of a sudden fade at some point and give the market a much needed correction. 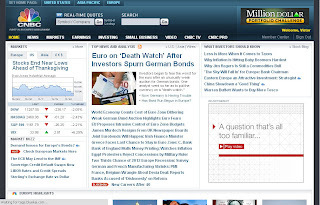 To prove my point, take a look at the screen cap of the news I took from the day the low was put in and prior to my November 22nd post predicting a rally. Technically speaking, almost every single issue on the news page is still present and it can be used at any moment for a sell off/correction. The market broke an important resistance level today and we're probably going to see more upside. 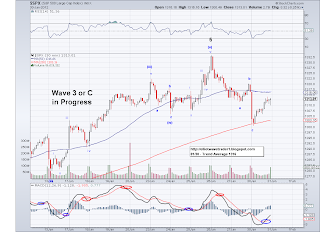 Going by the wave count alone, we're on the 5th wave but an extended one so I labeled the waves at the minute level to get a better picture. This 5th wave is barely ending its W3 so that would allow the market to correct and then go into another impulse to the 1330 level perhaps? 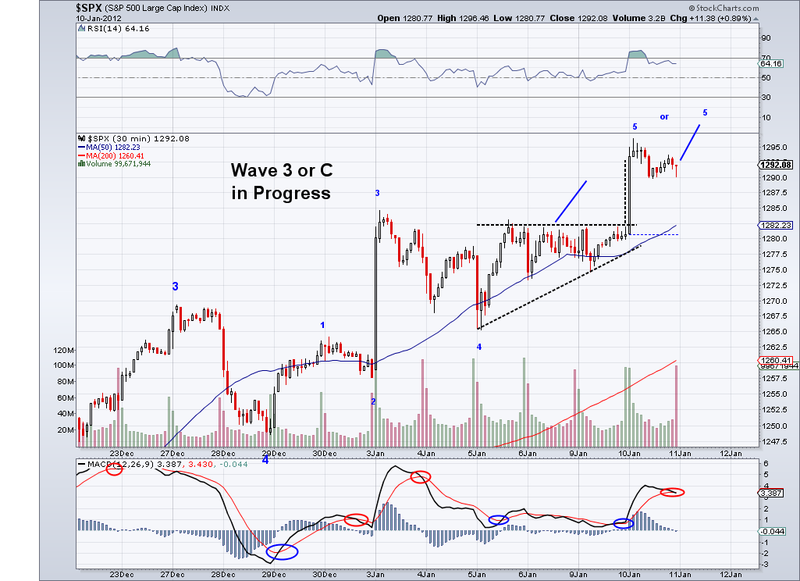 one key level to watch is 1285, this should hold if this count is correct. Too bad one can not fully juice the market sometimes but tops are always hard to pin point. However, should the market go crazy and get to 1330's in a rush (and in turn have a 40 point deviation from the Trend Average) then it will offer a good shorting opportunity as we're visiting the 200 day ma on the next bearish wave imo. So the market finally made it to 1300 after trying for a few days but it wasn't able to hold gains. Technically speaking, today's is enough to finish the rise from 1203, however, I notice a potential inverted head and shoulders on the 5th wave so the market might run up some more. The Trend Average is at 1287 and the market should roll over soon, it's been a somewhat long bullish wave (time wise) and what really matters is not where the top of this wave is but the bottom of the coming bearish wave. I am technically all cash now and waiting for the bearish wave to go long or an extended jump 40 points above the TA to go short. A lot of people have asked me over the past few months about the TA or The Trend Average so I decided to put together this post to explain it. 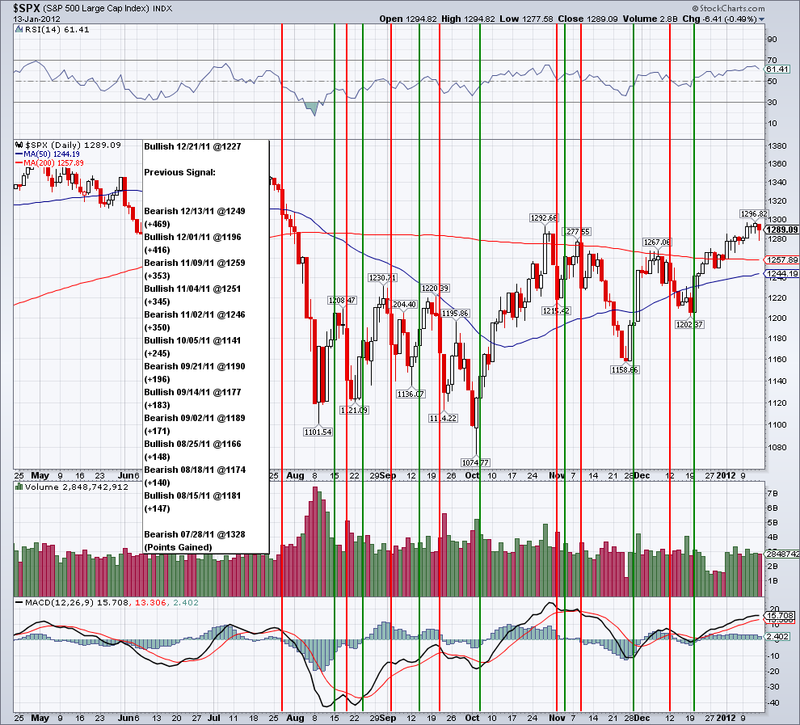 The Trend Average is basically a calculation of the market's opening and closing prices for the preceding 2 weeks. In doing this calculation, we have a number for the short term trend that can guide us as traders and in essence create situational awareness that is essential for day and swing traders. The TA, in combination with other better known moving averages and Technical Analysis tools allows us to trade with more confidence while reducing our risks of being trapped in a position. Over the last year or so I've added some elements to the way in which I trade the markets using the Trend Average. As volatile as 2011 was, not only was I able to navigate the markets without being on the wrong side of the market (and avoid big losses), but I was able to come out ahead without taking any substantial risks. 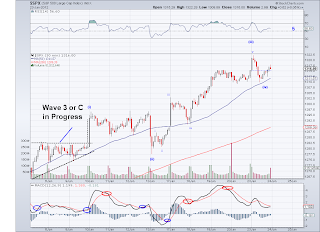 So whether you use traditional technical analysis, elliott wave, or fundamental analysis the use of the Trend Average increases the probabilities of successful trades. Below is a view of the Trend Average signals since I've started testing it in the summer. 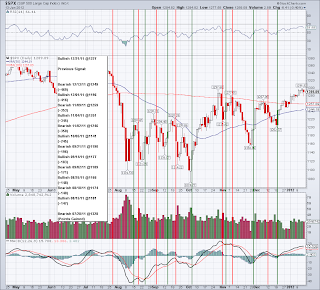 The green lines indicated a bullish trend and the red lines a bearish trend. 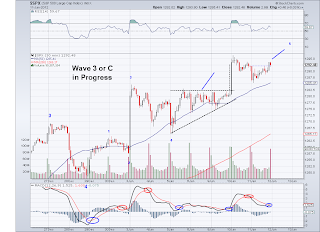 Triple Top or minor correction? The market showed signs of weakness today as it traded below the Trend Average for the first time in 3 weeks and in the process left a pattern that could potentially turn out to be a triple top. 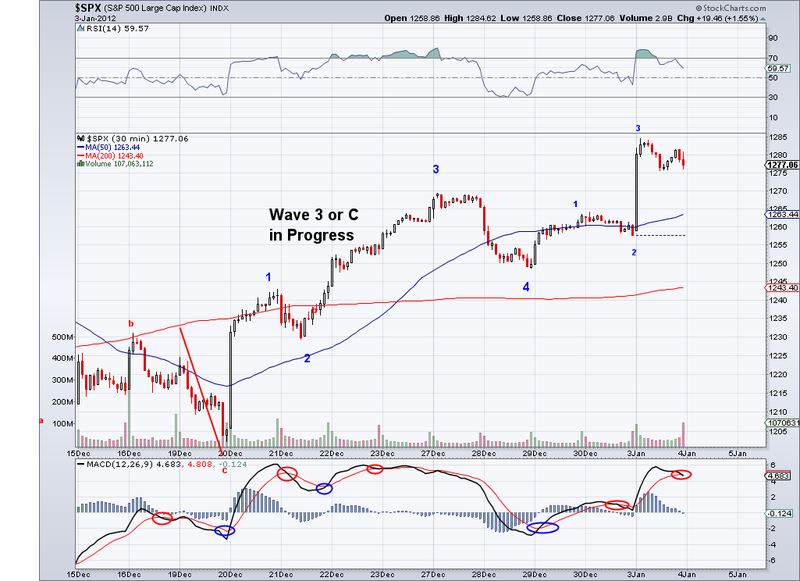 However, the market closed above the TA so we could still call this a minor W4 correction. 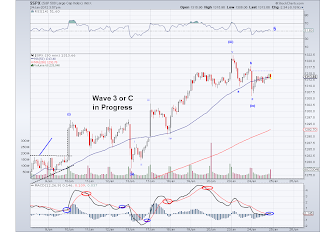 The count I posted is highly speculative as it goes against the trend but as you probably already know, I am leaning towards a substantial correction at this point. I think the market will correct to the 200 day ma (it already has to the TA) and I think we should see the market roll over starting next week or so. I sold the rest of my longs today when the TA was breached so I am mostly cash and hedged at this point. And like I said a few days ago if the market makes it to the 1315-1320 aread on one more quick impulse I will go short.. the Santa Rally can only last so long. The market seemed like it was on its way to 1300 this morning but instead traders piled up to take profits. So we continue to have resistance in the 1296 area but from the look of things, the market really wants to get over the 1300 mark before going into correction. Notice how all of a sudden things seem to be ok if you read the news, how the European issue appears like it is being solved. When the media is this positive, it is usually a sign of a top. I saved the news from the day the market bottomed at 1158 to make a point but I can't find the links now to post, if I find them tomorrow I'll post them so you can see how news themselves can be used as tool. So going forward the plan is the same. I'll unload the rest of my longs at a spike above 1300 or when the short term trend turns negative per Trend Average confirmation. 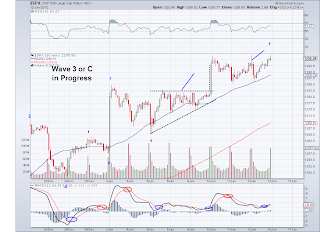 Seems like the market is still not quite finished rallying and we might see one more more wave to challenge 1300 as soon as tomorrow. But once it's done, I think the market will start a correction of a higher degree so we'll see the 200 day ma tested almost for sure in the next correction. So I am hoping the market will get very bullish in the next couple of sessions to finish unloading longs. The Trend Average is at 1277 and I will go net short if we get to 1317 (which I doubt at this point on this particular wave but one never knows). 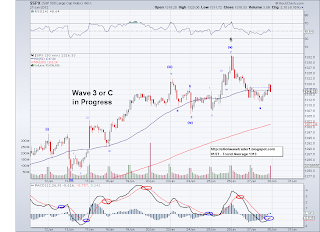 The fifth wave I had been waiting for finally materialized today and the market closed at the 1292 target I posted last week. So technically, the market has set itself up for a correction and in turn give us a glimpse of what the next few months will be like. 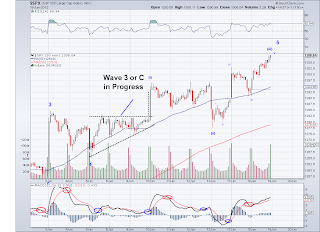 Since this intermediate wave can turn out to be a C or a Wave 3, I no longer can predict the new few months until the market gives us a clue if this has been a correction all along or the beginning of an impulsive wave to high 1300's/1400's. Whatever the case, I see this C or W3 complete or close to completion and we will either text the TA or the 200 day ma next and then rally from there for a intermediate 5th leg or we sell off impulsively from here on. The key level to watch will be the 200 day ma and the Trend Average will keep you safe as long as you're paying attention. I started to take profits today and hedged some long positions taken prior to the Santa Rally. And should the market rally some more (in a 5th of a 5th) then I'll unload the rest of the longs. Currently, trendlines and averages are pointing to a BULL market so it is dangerous to your portfolio to take up short positions until a confirmed trend change. I am planning to load up on longs again at the next bullish TA crossover (after the correction). 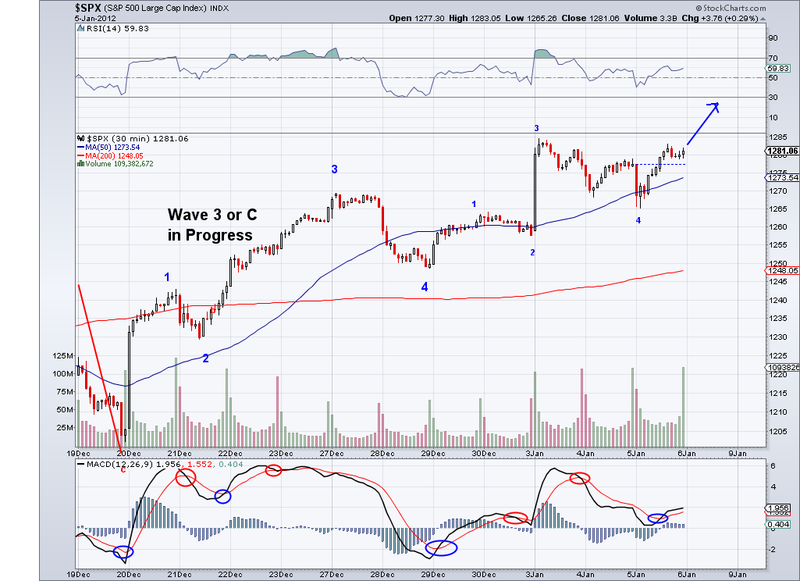 But should the market get 40-50 points above the TA, I will initiate shorts but very carefully. 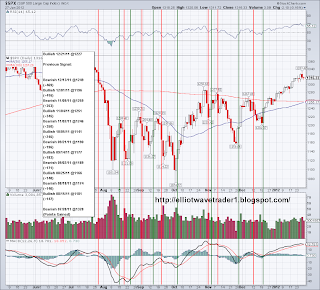 The market continued the correction today but at least we now have a clear pattern of where it wants to go. 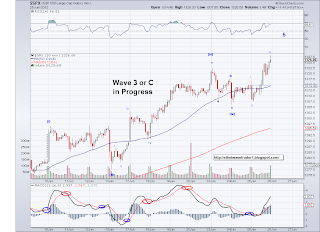 Today's market movement charted an Ascending Triangle and it goes well with the need for a 5th wave to finish up this intermediate C or W3. 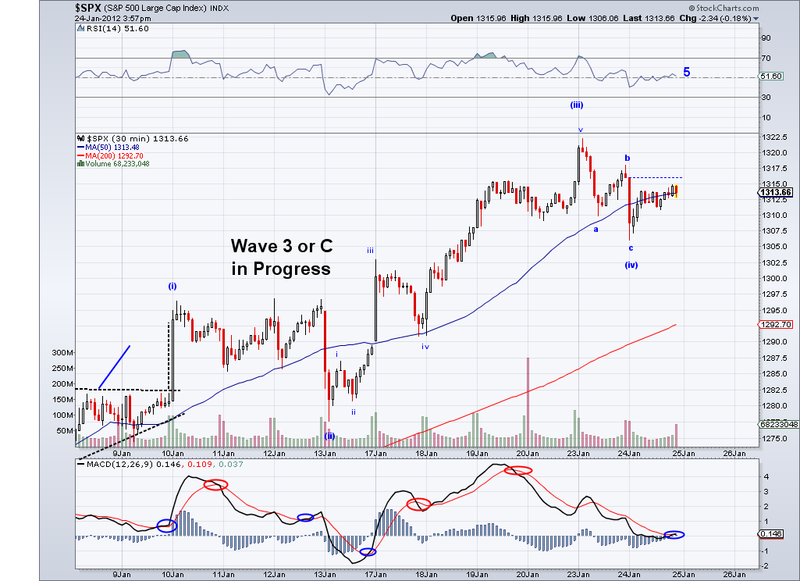 So I am assuming we will see a rally as soon as tomorrow to finally get to the 1292+ area. I just hope the rally doesn't just happen after hours as I'd like to start locking in some profit. The Trend Average is currently at 1270 so unless the market rallies from here, the short term trend can turn south at any moment. The market failed to rally as I had been expecting, however the waves continue to look corrective so Monday (or Tuesday) we should get an answer. At first the market attempted a rally in pre-market but this quickly faded and instead nothing much happened. But since we're above the Trend Average and seasonality is bullish around this time of year, I will continue to expect one last rally before a correction unless the market breaks the TA and confirms a bearish short term trend. 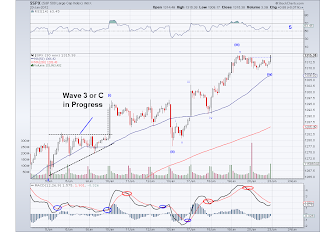 The confirmation at 1221 on Dec 21st has proven solid, so we'll see how much higher can the TA get. I was away yesterday on a business trip that took much longer than I had expected so there was no update. However, nothing really much has happened since the W4 was still in the works. But now that it seems like we have corrected enough, the market is ready to take on 1292 and possibly 1300 as soon as tomorrow. 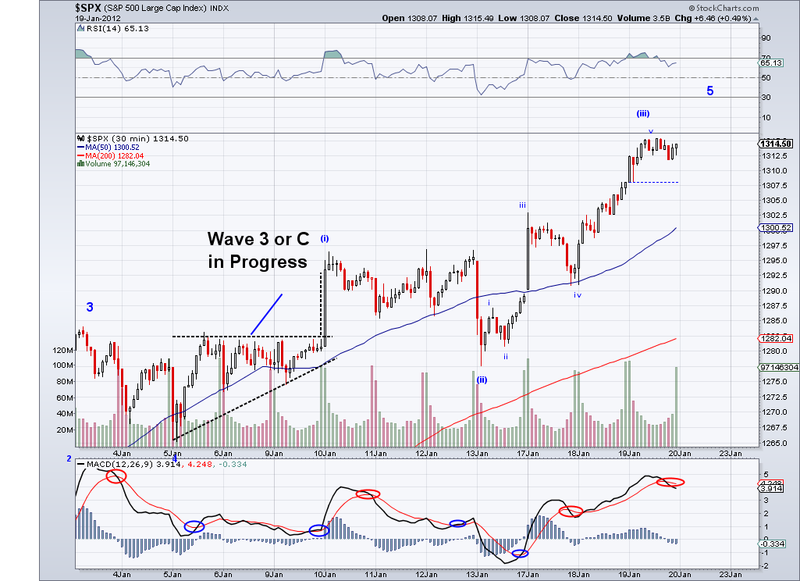 So chances are we will get a great jobs report or the market will ignore any negative news and rally and then I am pretty sure we will go into some sort of correction as the market is overbought and the wave from 1203 needs to be properly corrected. 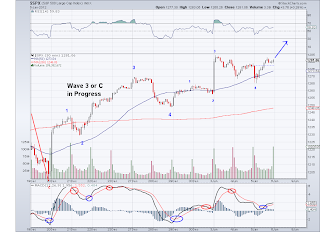 I am holding longs until this 5th wave materializes and will take profit, especially if we get a nice rally. In fact, I might even go short depending on how the waves evolve. The Trend Average is currently at 1265 and above the 200 day ma (very bullish! ), so if I see 1310 in the next couple of days I'll short as it is likely the market will test the TA for sure and very likely the 200 day on the corrective/bearish wave. 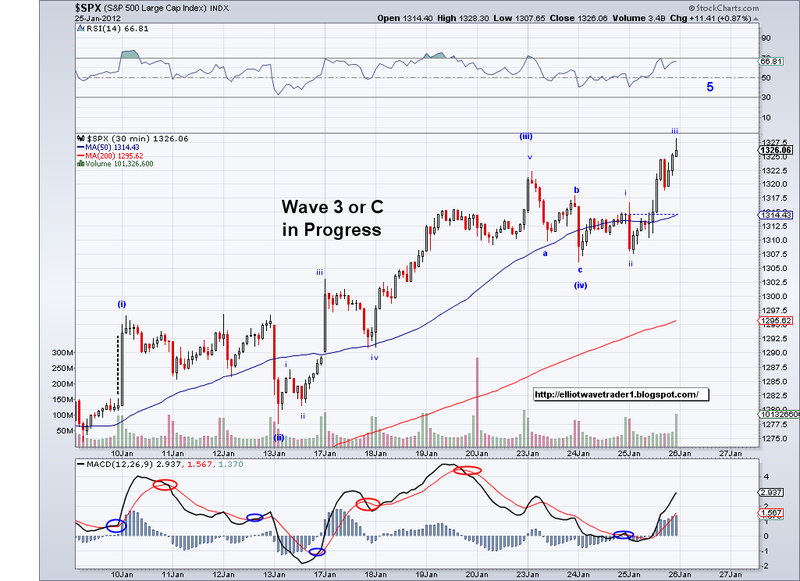 The market followed through and today's move confirms the 3rd wave of the W5. 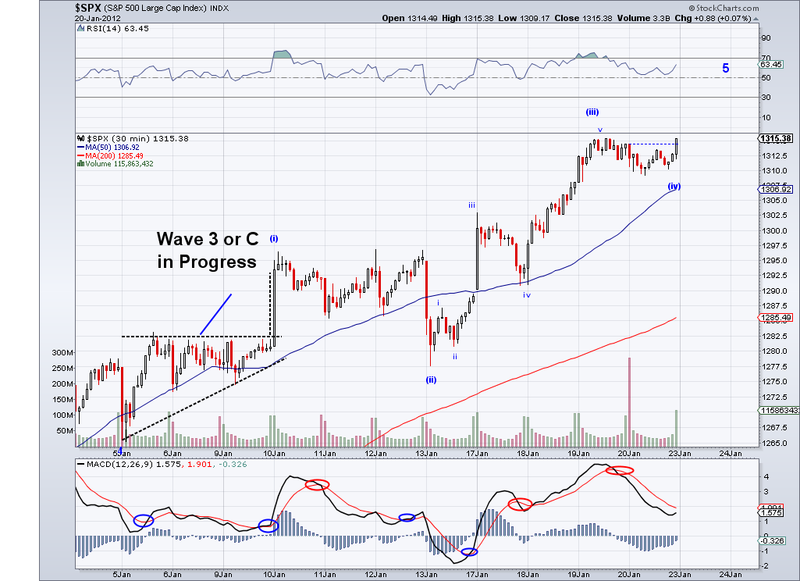 I think the market will test 1292 but most likely it will go above 1300 and some more. 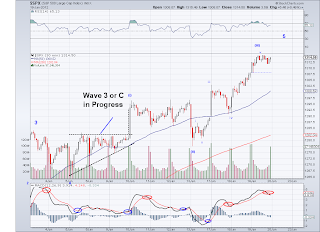 The current bullish intermediate wave that started at 1203 has a little more to go before getting exhausted so as soon as the W5 is complete it will be time to take profits and get back at the next bearish period, which should come in the next week or two. Also, today's close is very bullish as we're well above the 200 day MA, the Trend Average will also be above it tomorrow and we got the 13/34 weekly cross and soon the 50/200 Golden Cross. So probabilities favor a beginning of a bull market at this point and the only way this could be reversed is if the coming bearish intermediate wave trades well before the 200 and the 50 day MA.